It is the season for a refreshing cocktail that's extra easy to make and perfectly suited for a brunch. This recipe calls for pomegranate syrup, which can be found at larger supermarkets. 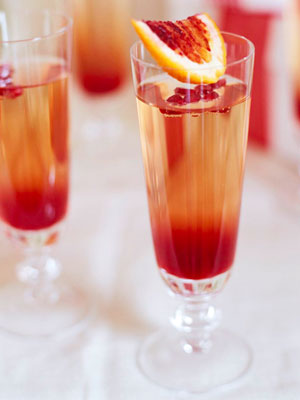 Add 2 tablespoons pomegranate syrup to each of 8 champagne flutes. In a 1-1/2- to 2-quart pitcher combine the wine and sparkling water. Pour wine mixture into each glass to serve. If desired, garnish each with pomegranate seeds and/or a blood orange wedge.